Our Little girl started soccer this last week and is loving it! My husband wanted her to be able to practice at home so he decided to make a soccer goal for her. It was so easy to make and cost way less than any other soccer goal we could find. Here is how he did it! One reason I LOVE Home Depot is because they will cut things for free if you ask them! My husband cut it himself with a hand saw because he had to figure out the measurements. Either way is really easy. Then you just have to put it together. He made the bottom first then worked up. Add the diagonal 31″ pipe last. Depending on your quality of pipe 31″ might be a little long. So just shorten it to what will work. We didn’t glue it together because it was so sturdy we felt we didn’t need to. So I wanted some type of net for our Goal so I went to Walmart and purchased a Net Material for 98 Cents a yard. I bought 2 yards and it was plenty. Then I bought Zip Ties (also from walmart) to put my net on. So funny! My husband had the idea and made this same thing about 2 years ago and we were just talking about where we could buy a net for it! Thank you! :) Now we know! Can't wait to show this to him! That is a great idea. I want my husband to make us one. That's awesome! My dad built us quite a few of these growing up. At one point I think he made sets for the whole soccer league to use. I love this idea!! We have purchased everything except the netting and can't seem to find netting. So I am wondering if anyone might know where to find some?? Thanks so much! Look for Tulle found at fabric stores. I also love this idea. Might have to send to my niece for Christmas. She is an avid soccer player. Our company?s products are PVC pipes, PVC riser pipes, PPR pipes, PE Pipes, PPRC Pipes, PVC column pipes, PVC plumbing pipes, UPVC pipes, & Water Storage Tanks and All type of pipes fitting, Supplier, Wholesalers, exporters & manufacturers in India. 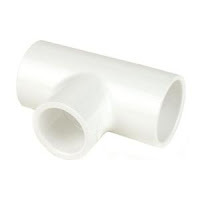 Shand Group products PVC pipes, Plastic Pipe, pipes & fittings, PVC pipes & fittings, Column pipes, CPVC Pipes & Fittings manufacturers, Exporters, Suppliers in bangalore India . Shand Group conform to highest levels in quality and are tested for strength and durability under the most stringent international standards. Our companys products are PVC pipes, PVC riser pipes, PPR pipes, PEX Pipes, PPRC Pipes, PVC column pipes, PVC plumbing pipes, UPVC pipes, & Water Storage Tanks and All type of pipes fitting, Supplier, Wholesalers, exporters & manufacturers in India. Thanks for the amazing tutorial, my daughter absolutely loves these. When they aren't being used for soccer, they double for a house, a tent, and even a trap sometimes. I pinned this long ago thinking it was such a good idea. Yesterday, my son came up to me and asked for a soccer goal for Christmas. After looking at the prices for goals, I remembered this pin. I'm off to Home Depot to make this instead! Thank you so much! All about Pipe. Trimurti is the Largest manufacturer of PVC Pipes and Fittings in India.Trimurti is the pvc pipes suppliers, plastic pipes manufacturers and pvc pipes manufacturers. Get details of manufacturers & exporters of pvc pipes, plastic pipes, pvc pipe manufacturer, plastic water pipe, plastic drain pipe, pvc plastic pipe, pvc pipe, plumbing plastic pipes, pvc plumbing pipes,large plastic pipe. I am using much similar PRODUCTS, I thank you for the detailed information about this. Has anyone taken on the thought of enlargement of this plan. Our "little" soccer player is growing and we have a large enough yard...don't need a regulation adult size or anything but need something bigger than this. Help! Thank you again for another? feel good, uplifting, that there are good people in this world story?. We read so many stories that are negavite about people and what they do to others. A random act of kindness is always such a great thing to hear about. Peace and blessings. So glad you joined me for the Monday Kid Corner party. If you haven?t linked up today, we?re live at www.mondaykidcorner.blogspot.com. Love this! Our store-bought goal just broke last week, and we have tons of PVC around the garage, so this is the perfect replacement. Thanks for sharing at Let's Hear It For The Boy Thursday! 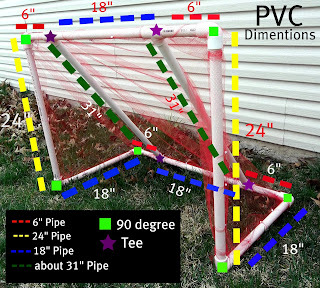 We decided we wanted to make a soccer goal for our kids, and when I googled instructions for a PVC pipe soccer goal, this came up. It worked perfectly! 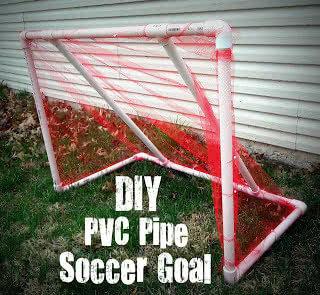 We went to The Home Depot and cut and bought enough PVC pipe to make two goals. We had an old hammock we weren't using that we cut up to use for the net. It came to about $18 for two! Thanks for the instructions! Thanks for this post. Last year we bought a collapsible net for soccer, football, and golf practice and spent a ton. Less than a year later the poles of the net have been destroyed. I was looking for a way to build an inexpensive, sturdy frame for our existing net and this is perfect. My sons will be thrilled that we can fix their net. So, we made one last week. I went to Walmart and purchased the same exact red netting as shown in the pictures above. We also used zipties to secure the netting to the posts. It worked great for all of 15 minutes! Every time my son would kick a goal, the ball would barely hit the netting and it would rip. Didnt even last the 30 minutes that it took to put it together. Not very happy!!!! I suggest for everyone not to try this netting! We made this on a larger scale with 2" PVC pipes last summer. I hadn't caught the part about the cheap Walmart net, so ours is Florida Nets from Amazon. I left it outside the entire year and it has held up great. We are getting great use out of it too. Thanks for the idea! 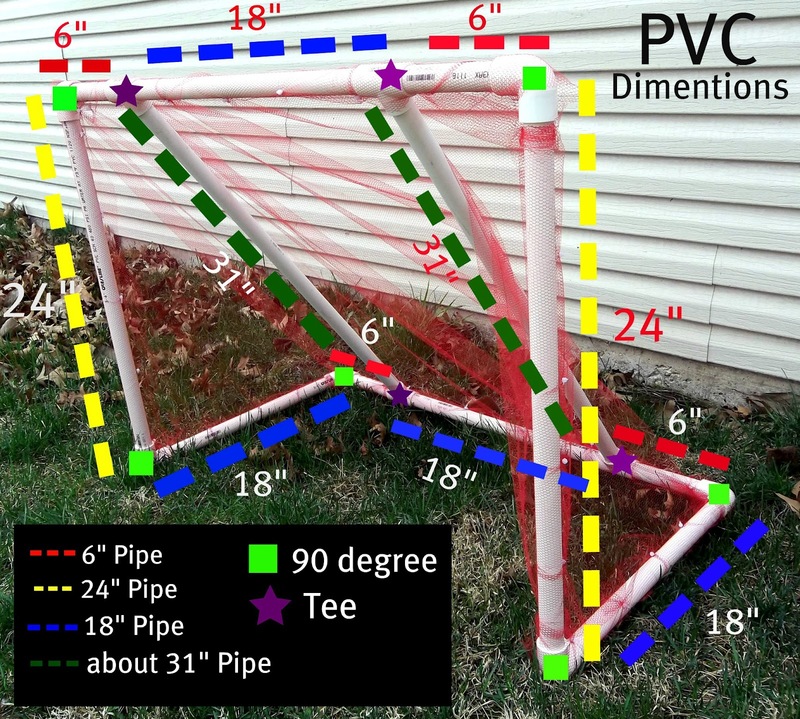 I am now planning a PVC pipe ball pit and would like to try the netting you got at Walmart if you think it will hold up for a ball pit w a bunch of active boys in it. Is it in with the fabric bolts? This is so fantastic! This is for sure on mine and my husband's to do list when it gets warm again. Our 2 and a half year old is going to LOVE IT! I build this for my son he loves it. We the net fabric ripped apart on us thought. I found some net for pretty cheap on amazon.com. We cut the net to the right size and just put the pipes through the holes. It holds very securely and no need for cable ties to hold it on! Love it! My son made one very similar.... We purchased a roll or Deer Stop at Menards for the netting. It was under $5.00 for the netting and I can make lots of other fun stuff with the leftovers. Next on the list is a PVC ball bin (with leftover netting) for all the basketballs, soccer, football & other misc. balls. Thanks so much for this tutorial! Just to let you know that I made a goal for my kids today, all the way in sunny South Africa! :) They are SO excited! Thanks for the innovation. We do deal with similar products PVC Braided hose pipe . Could you be a little more specific on where these pieces need to go? Like the 4 6" pieces are what? The base, the height, etc.? Same for the others.